The Secret Weapon of Successful Professionals? Good Manners. Getting someone to talk about themselves can bring them the same kind of pleasure as food or money . Asking about someone else’s interests and work during a conversation may open the person up and endear them to you. Writer Paul Ford suggested employing the line, “Wow. That sounds hard,” in social settings, but it works in business as well. People generally think their jobs are difficult, and will gladly unload their burdens onto you. Unwelcome hair-touching is a documented offense in social settings. But as more workplaces become more casual and social, the risk of similar offenses in the office, like awkward hugs and shoulder rubs, rises. American etiquette authority Judith Martin, also known as Miss Manners, advises sticking to handshakes, because a little distance creates respect (1:07 in the video). Be polite always. You may dislike someone at first meeting, but Ford points out that they or you might just be having a bad day. If you later decide you like them or you have to work together, you were polite the first time, so there won’t be any friction. 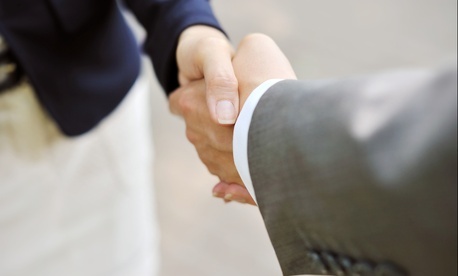 First impressions are key; nailing them every chance you get is a good insurance policy. Granting someone the power of authority makes them more likely to share information with you. That applies to situations in which you already know your desired outcome; if you ask for advice instead of asserting your solution, you entice the other person to cooperate. Likewise with a favor, because our brains don’t understand why they would do something for a person we don’t like, allowing someone to do something for you tends to endear them to you. No one likes a bad gossip, but if everything you say about other people is nice then you’re the best kind of gossip. Plus, when you talk about someone else, the listener associates the traits you mention with your own character. Wouldn’t you rather those traits be positive? It’s the most awkward part: you’ve run out of things to say, as have they. The person who can artfully bring the conversation to a close is doing everyone a favor. A good way to end is with a line like, “It was great to meet you, I’d love to talk more about [something interesting to both of you] soon.” Then exchange business cards or emails or phone numbers, and be on your merry way. If you’re interested in working with someone, you want to follow up with them. A “thank you, nice to meet you” email or note is good, but following up on a specific interest—like scuba diving, travel, or an article you both read—is better. It shows you were actually listening.